Jean Kourafas of Basimos Digital Marketing was recently interviewed by Jay Pateakos, Executive Director of the Sandwich Chamber of Commerce, and featured in the Sandwich Chamber of Commerce’s newsletter. What is your focus at Basimos Digital Marketing? At Basimos Digital Marketing I focus on helping small businesses in the hospitality and customer service industries get more online customers without being overwhelmed by technology. 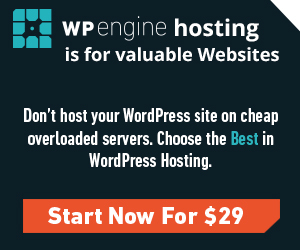 So many small business owners that already have an existing web presence don’t have the time, knowledge or sometimes even the access to update their website in a manner that will bring them more customers. On top of that, technology and search engine algorithms change frequently as do the marketing tools. I assist my clients with digital strategy, implementation, and support so they may continue to focus on their business knowing their online presence is continuously working for them. How about a little history of Basimos? Basimos.com was launched as Basimos Internet Marketing Solutions in 2002 while I was working in Silicon Valley. When I relocated back to the Cape two years later, I was offered the opportunity to manage CapeCod.com. Having previously worked sales & marketing in the hospitality industry here on Cape Cod, it was a perfect fit for me. For the next decade, I put accepting new clients for my consulting and internet marketing business on hold as I managed the online services for Cape Cod Broadcasting Media full-time. During this time, I was also able to learn more about the digital marketing needs and challenges of our local business community. I officially relaunched Basimos Digital Marketing more than a year ago and am thrilled with where my path has led me as I’m doing what I love in the community that I love! What sets Basimos apart from other like companies? Jean Kourafas, working out of her remote office, sets Basimos apart from others. (That rhymes so now you too can pronounce my last name!) I have been building, managing and marketing corporate websites since 1996 and I never stop learning. I’m quick to pick up new skills and techniques to adopt either from online resources or by attending industry conferences across the country where I also get to network with like-minded individuals. The combination of my marketing and technical skills along with my hospitality experience has proven invaluable, as I am able to offer my clients comprehensive digital marketing solutions that are both logical and effective with a hands-on and customer-focused approach. 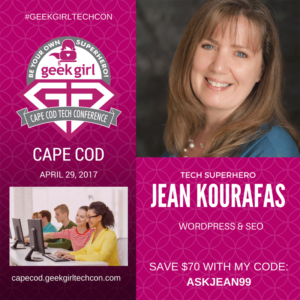 Join me at Geek Girl Tech Con Cape Cod on April 29th! I’ll be teaching again this year at Geek Girl Tech Con so I hope you join in for a full day of accelerated learning! Who: Geek Girls and Guys will teach anyone interested in learning more about technology, all ages welcome! 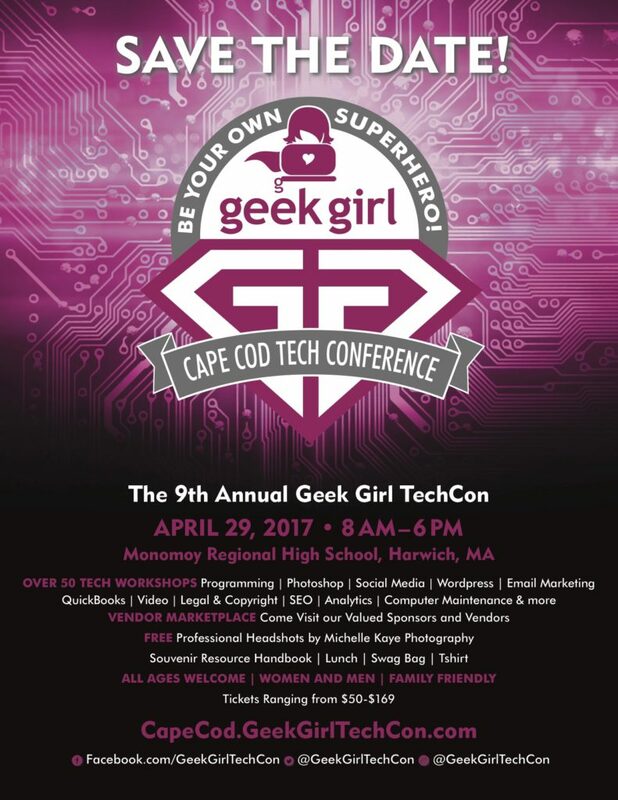 What: Geek Girl Tech Con Cape Cod will feature more than 40 workshops throughout the day in addition to the one-on-one help desk area. Traveling from off-Cape and want to spend the night on Cape? The Heritage House Hotel in Hyannis is located right on Main Street in Hyannis, about 20 minutes from Harwich, and offering a special discounted rate of $69 pn/do. Call 1-800-352-7189 and ask for the GEEKGIRL rate. When: Saturday, April 29th 2017 – Registration opens at 8:00 am and day begins at 9:00 am and ends at 5:00 pm. Why? Because you should NEVER stop learning and I have a discount code for you to save 40% off of general admission!